If Harmony stops sending commands or is not responding we recommend rebooting your remote. You will not lose any device information. If you're using a Harmony hub‑based product, there's no need to power off your devices before rebooting your remote. Harmony will gather your device power state information from Harmony Hub using your Wi‑Fi network once your remote powers back on. If you own a Harmony remote that doesn't use Harmony Hub, power off all of your devices such as your television and AV receiver. After Harmony reboots it will assume everything is in a powered off state. Harmony 200/300/350 and Harmony 600/650/700 devices can be rebooted by removing and replacing the batteries. If this does not resolve the issue we recommend syncing your remote using the MyHarmony desktop software as this will restore a possible corrupt firmware or configuration. Harmony Pro, Elite, Ultimate, Ultimate One or Touch remotes may be rebooted by pressing and holding the Off button at the top of the remote for approximately 15 seconds. If this does not resolve the issue we recommend performing a factory reset of your remote, then downloading your configuration again using the MyHarmony desktop software. Press and hold both the Menu button (located above Channel Up) and the Off button for approximately 20 seconds. You will see a remote with a circular arrow. Sign into your account using the desktop software. Connect the remote to your computer using the supplied USB cable. 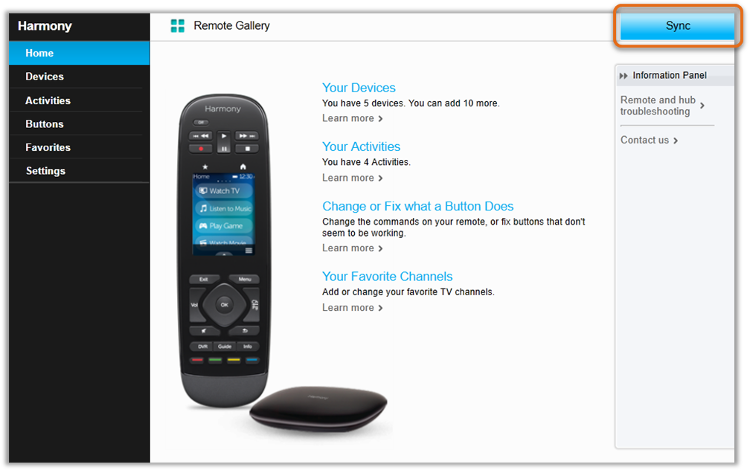 Select your remote from the Remote Gallery. Harmony Ultimate One or Touch: Press Sync in the upper right corner. Harmony Elite or Ultimate: Press Remote and hub troubleshooting. Follow the on screen prompts to restore your remotes firmware and settings. If your Harmony hub frequently disconnects from your Wi‑Fi network, there may be a conflict in your home network's configuration or another issue not discussed here, please review our Wi‑Fi won't connect or frequently disconnects from the hub article to further troubleshoot this issue. If Harmony stops sending commands or Harmony app is unable to discover the hub, rebooting Harmony Hub often resolves the problem. To reboot Harmony Hub, disconnect the power cable, wait 10 seconds, then connect it again. Rebooting your router by disconnecting and reconnecting its power cable sometimes helps with any Wi‑Fi connectivity issues. If the Harmony app continues to control your devices but the Harmony Smart Control remote or Harmony Smart Keyboard does not, you may need to replace your batteries, the On/Off switch on your Smart Keyboard may be turned off, or you may have to re-pair the hub with your remote or keyboard. If Harmony stops sending commands or if the Harmony Express app is unable to discover your blaster, rebooting your Harmony blaster will often resolve the problem. To reboot your Harmony blaster, disconnect the power cable and wait 10 seconds, then connect it again. It will take about 30 seconds to power back on. If your remote is blinking red, it needs to be charged until the light turns solid white. However, while plugged, in the remote will be operational. If your blaster light is red, launch the Harmony Express app to see if there is an issue with the remote connectiing to your Wi-Fi network.